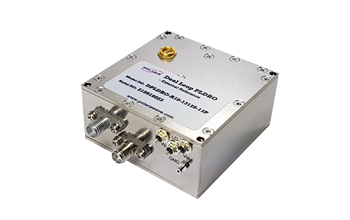 The PLDRO (Phase Locked Dielectric Resonator Oscillator) provides the ultra-low phase noise and excellent frequency stability when it is phase locked to a clean and stable crystal reference signal. 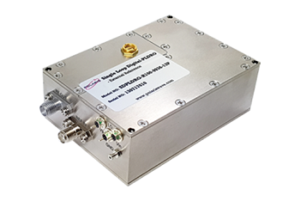 The PLDRO provides ideal signal for commercial and military systems requiring ultra-low phase noise, low spurious, and high frequency stability. Our PLDRO series are available in three types: Single Loop PLDRO, Single Loop Digital-PLDRO, and Dual Loop PLDRO. The Single Loop PLDROs provide an output frequencies whose phase is locked to an integer multiple of the external reference. 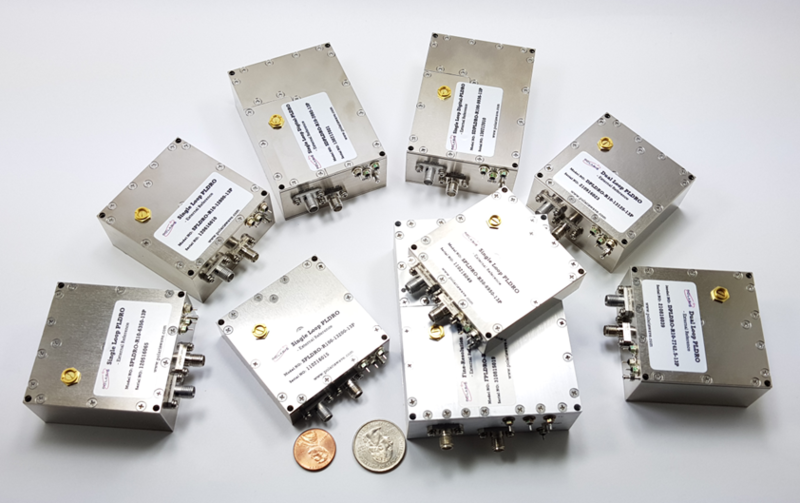 This series provide output frequency up to 28 GHz. In addition, two package options are available. The first option corresponds to single bed package without Frequency Multiplier. 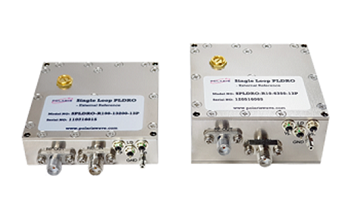 This option provides output frequency from 5 GHz to 13 GHz and is the slimmest package in our PLDRO products. The second option corresponds to double bed package with Frequency Multiplier. This option provides an output frequency from 14 GHz to 28 GHz and has a double bed hosing construction. ▪ Compact package: 2.25"[57.15] x 2.25"[57.15] x .63"